Wise Owl’s Health Pack contains Eric Llewellyn’s first choice supplements for men aged 18 – 45 years. 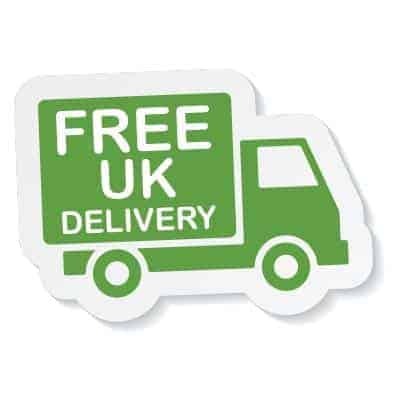 It includes Multivitamins & Minerals, Anti-Oxidant + Coenzyme Q10 & Magnesium 100mg. Wise Owl's Health Pack for men aged 18 - 45 years, contains Eric Llewellyn's first choice supplements for men in this age range. This health pack is designed to help you feel at your best, even when facing the challenges that life can throw at you. Included supplements may help with nutrition levels, energy levels, muscle function, blood pressure, sleep... & much more! Even whilst you are juggling your busy schedule of everyday life, we want to help you look after yourself for now... and for your future. Wise Owl Food State Multivitamins & Minerals have been specifically formulated to help your body obtain its optimum level of nutrients. 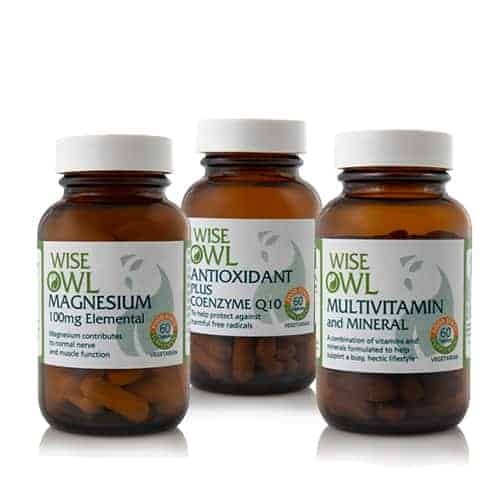 Wise Owl's Antioxidant Tablets contain all the major antioxidant vitamins & minerals, along with Coenzyme Q10, an integral part of energy metabolism. Other supplements that might be of interest are: Essential Fatty Acid Complex, Zinc & Copper, GTF Chromium & the cleansing Probiotic supplement. Product Ingredients: Vitamin C incorporated in citrus pulp; lactobacillus bulgaricus providing niacin, phosphorus, pantothenic acid, zinc, iron, para-amino-benzoic acid, inositol, calcium, magnesium, vitamin B6, riboflavin, thiamin, copper, manganese, iodine, chromium, molybdenum, vitamin D3, vitamin B12; vitamin E combined in yellow pea; yeast concentrate* providing choline, boron, folic acid, biotin, selenium, vitamin K, selenium; beta carotene incorporated in carrot concentrate; vegetable stearic acid; tablet coating: hydroxypropyl methylcellulose. Product Non-Actives: vegetable stearic acid; tablet coating: hydroxypropyl methylcellulose. * Contains no live yeast at the time of manufacture. Product Ingredients: Lactobacillus bulgaricus providing magnesium; vegetable stearic acid, tablet coating: vegetable cellulose. Product Non-Actives: Stearic acid and vegetable cellulose. Product Ingredients: Vitamin C and bioflavonoids incorporated in citrus pulp; coenzyme Q10; vitamin E combined in yellow pea; beta carotene combined in carrot concentrate; lactobacillus bulgaricus providing zinc; mineral enhanced yeast* providing selenium; vegetable stearic acid, silicon dioxide, tablet coating: vegetable cellulose. Product Non-Actives: Product Non-Actives: Vegetable stearic acid, silicon dioxide, and vegetable cellulose. * Contains no live yeast at time of manufacture. Suitable for people with candida & yeast sensitivities. - Children aged from 5-10 years = 1/2 tablet daily. - Adults and children aged from 11 years and over = 1 tablet daily....or as directed by a practitioner. Men's Supplements - Ages 18-45: Read more about which nutrients Eric Llewellyn recommends for men aged 18 - 45 years, along with some handy tips on how you can help keep your body healthy. Food State Supplements: Read more about why our food state supplements are so special... made from whole food.